Over the last few years, many of the most exciting developments in pro AV technology have been on the latter half of that two-letter acronym that encapsulates our industry. While audio has hit a plateau of maturation to some extent, video continues to skyrocket with new technologies to render images bigger, brighter, clearer, and more colorful than ever before. The following product showcases focus on the two chief canvases of video presentation—flat panels and projection screens—and the technological developments that have allowed them to display content in an increasingly captivating, versatile, and affordable manner for almost any kind of visual application imaginable. The What: The NEC X551UHD is a new 55-inch display that rounds out its lineup of UHD models in 65-, 84-, and 98-inch models. The What Else: The X551UHD features UHD/60Hz support through its Open Pluggable Specification (OPS) slots, and enables users to insert the optional NEC SB-08DC card into the OPS slots to give users an extra HDMI 2.0 or DisplayPort 1.2 input. The SB-08DC also is fully HDCP 2.2 compliant. The X551UHD and the other displays also have the ability to enhance content non-native to the resolutions of their panels. Expanding on normal upscaling—when a full high-definition signal is brought into the system—the new UHD upscaling feature uses algorithms to adjust pixels based on the intensity and color of surrounding pixels in order to provide an even sharper and richer image. The Bottom Line: Featuring 4,000:1 contrast ratio and up to 10-bit color performance, X551UHD’s high-resolution imagery and versatility make it well suited for a variety of applications, including design, corporate, retail, and transportation. The What: LG’s Dual-View Flat OLED is the first digital signage solution to offer OLED technology to the commercial marketplace, according to the company, and provides a two-sided media experience in 1080p resolution. The What Else: OLED is a new category of display that delivers a dynamic picture with deep blacks and vibrant color, even from wide viewing angles, unlike what LCD/LED displays can deliver. With OLED, each of the screen’s 8 million pixels can be turned on and turned off. That means blacks rendered by LG’s OLED displays are up to 200 times deeper than those of an LCD panel, creating an infinite contrast ratio and bringing colors to life like never before possible. The Bottom Line: With its very slim profile, measuring 8.94mm (0.4 inches), and three different installation options—ceiling suspension, wall-mount, and floor stand—this unique, flat OLED commercial display allows retailers to plan the most efficient use in any retail space while utilizing a high-end display solution. The What: The ViewSonic CE7061T is a 70-inch, 10-point touch interactive flat panel display. Delivering a highly collaborative display solution, this large-format display is designed for stimulating interactive learning in classrooms and collaborative brainstorming in boardrooms. The What Else: This display, when paired with PC-less operation and pre-installed annotation software, allows multiple users to simultaneously write or draw using fingers or styluses. With 350 nits of brightness and wide viewing angles, the CDE7061T provides high visual performance in bright settings or rooms. With a built-in dual-core processor, 8GB of internal storage, and versatile connectivity options including HDMI, VGA, RS-232, RJ45, and USB ports, this commercial display provides powerful computing for annotation and multimedia playback without the need for a PC. The Bottom Line: ViewSonic’s CDE7061T is designed to assist with teamwork and collaborative sharing. From corporate huddle spaces to teaching through interactive applications using the integrated ViewBoard for Education software and Mersive’s Solstice collaboration software, the CDE7061T is engineered to help bring viewpoints, concepts, and designs to life. This display can be utilized in Android-, iOS-, and Windows-based environments. The What: Planar Systems is now shipping its next-generation UltraRes Series 4K LCD display line, designed for ultra-high resolution commercial applications. The What Else: Available in 98-, 84-, and 75-inch diagonal models, the latest generation of Planar UltraRes Series includes built-in Planar MediaPlex Plus Processing for enhanced versatility and control of multi-source viewing. It also offers cutting-edge video performance with support for native 4K resolution at up to 60Hz that can be driven via single-cable HDMI 2.0 or DisplayPort 1.2. Other features include advanced multisource viewing, flexibility with Intel’s Open Pluggable Specification, and advanced energy efficiency and ruggedness. The Bottom Line: The Planar UltraRes Series is designed for professionals in a wide variety of commercial uses who require a large viewing area, very high pixel density, and enterprise-level features that allow teams to collaborate around highly immersive and detailed visual information. It is also well suited for interactive digital signage in diverse settings such as retail stores, corporate lobbies, airports, and museums. The What: Barco’s LDX-8482 is a large, high-quality display that was optimized for use in critical business environments. The What Else: With a screen diagonal of 84 inches and UHD resolution (3840x2160 at 60Hz), this screen offers the accuracy of four full HD displays. Features include picture-in-picture support, offering users the possibility to display even more information. Using the display’s integrated OPS slot, the functionality of the display can be further enhanced to include additional sources. The Bottom Line: Engineered using the most durable components available, the LDX-8482 was designed for professional applications in which reliability is of utmost importance. This includes control rooms and crisis rooms, but also boardrooms, high-end meeting rooms, and retail and advertising applications. The What: The Sony FWD-85X850D is an 85-inch Pro Bravia 4K HDR UHD display with Android operating system. The What Else: The FWD-85X850 features a number of features to enhance the viewing experience. In addition to heightened contrast through high dynamic range, it features Sony’s TRILUMINOS color technology, which enhances color depth for noticeably brighter and more realistic colors. 4K Processor X1 technology further enhances the picture’s color, contrast, and clarity, and Motionflow XR 960 refresh rate technology optimizes the clarity of high-motion video. The 85X850D’s Android OS also features Google Cast for built-in BYOD collaboration. The Bottom Line: Featuring UHD resolution and high dynamic range, plus enhanced color with TRILUMINOS technology, the FWD-85X850D is well suited for commercial applications that require the highest levels of visual impact. The What: Panasonic has expanded its EF1 Series of entry-level displays to include 84-and 75-inch sizes, offering a cost-effective solution for digital signage, or for general use in the office or classroom. The What Else: EF1 Series displays feature a built-in USB media player, eliminating the need for set-top boxes or other external devices and reducing cable connections in offline environments, with updates to USB memory devices via LAN when connected to an intranet (ideal for difficult-to-access installations). An IPS panel assures excellent all round visibility and outstanding picture quality, while the narrow bezel and quality finish help enhance nearly any interior space. The Bottom Line: The EF1 Series blends high imaging performance with adaptability and efficiency, and is built for self-contained or networked digital signage or as an office, education, retail, or communication system. The What: Samsung’s new standalone displays (PHF and PMF Series) provide a slim, strong and simple signage solution for environments facing tight or irregular space limitations. The What Else: Featuring a slim-depth design (29.9mm) and narrow bezel (6.9mm), the PHF and PMF displays are among the thinnest on the market and can accommodate a range of business settings. The Tizen-supported standalone displays are designed for uninterrupted 24/7 content delivery, and an integrated centralized infrared receiver further ensures continued performance in any environment. A non-glare frontal panel reduces natural and ambient light reflection to ensure continuous readability. The new standalone displays also are IP5x certified, validating their dust-resistant composition and ability to withstand various conditions. The Bottom Line: A host of additional design features further enable the PHF and PMF Series displays to deliver clear, brilliant content regardless of location. The What: BenQ has added new models to its RP Series of interactive flat panels (IFPs). The new displays are designed with a range of features and capabilities to smoothly transition any classroom to fully immersive active learning environments. The What Else: The new RP750 75-inch, RP703 70-inch, and RP653 65-inch displays feature full HD resolution joining the existing 4K RP790 79-inch display to round out the lineup. Along with 20-point multi-touch capabilities, these screens feature technologies that aim to provide a healthier viewing experience for teachers and students, such as bacteria-resistant glass coatings and BenQ’s exclusive Eye-Care features, including anti-glare glass to minimize light reflections and improve readability, as well as low blue light and ZeroFlicker backlight technologies to help reduce eye fatigue during long hours of content viewing and instruction. The Bottom Line: Available with DisplayNote, a free bundled desktop and mobile application, the BenQ RP Series IFPs allow educators to create more collaborative lessons by streaming any content directly from their computers or via the cloud to multiple participants across various devices. The What: Christie has launched the FHQ552-T, FHQ842-T, and FHQ981-L flat panel displays with ultra-high-definition resolution. The What Else: The Christie FHQ552-T features 10-point touch capabilities, built-in speakers, and an Open Pluggable Specification (OPS) slot. 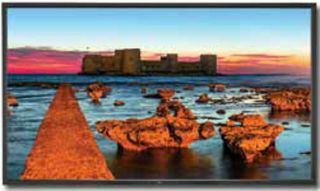 Replacing the FHQ841-T is the FHQ842-T, a powerful and versatile 84-inch display, also featuring 10-point touch. The Christie FHQ981-L 98-inch flat panel delivers exceptional image quality, contrast, and color-rich images for business, education, houses of worship, small control rooms and digital signage applications. The FHQ981-L is equipped with built-in speakers, multi-window capability, along with an OPS slot for compatibility with digital signage devices and pluggable media players. The Bottom Line: All three models in the FHQ series are suitable for meeting rooms, offices, lobbies, and architectural displays, and can be banded with Christie Brio, Christie Spyder, and the Christie Pandoras Box media server. The What: The SB-8418UHD is the outdoor television manufacturer’s largest screen size ever offered, and its first 4K model. The What Else: The 84-inch includes integrator-friendly features like built-in HDBaseT along with HDMI 2.0 and HDCP 2.2 capabilities. To allow for optimal outdoor operation, the media bay powers many media players without the need for external cords. As part of SunBriteTV’s extremely durable Pro Series, it features a glass shield to protect the LED panel. The ultra-bright (800-nit) LED screen and direct sunlight-readable capability displays a clear image in even the harshest lighting conditions. The Bottom Line: Designed for permanent outdoor installation, the 84-inch display features weatherproofing technology that protects from rain, snow, salt corrosion, dust, and insects, and keeps it operating in temperatures from minus 40 to 122 degrees Fahrenheit. The What: The Parallax Thin screen from Da-Lite features the company’s Parallax 0.8 surface for standard-throw projection, ambient light-rejecting technology, and ships assembled with a thin-bezeled frame. The What Else: Parallax Thin screens feature a 3/8-inch bezel aluminum frame that is only one inch deep, for a sleek aesthetic. The screens feature an advanced optical lens system that rejects light. This new technology mimics the look of a television when it is on and when it is off, but without the glare from windows or lighting fixtures. The Parallax material’s micro-layered optical lens system blocks 96 percent of ambient light, while allowing for an 85-degree-wide viewing half angle. The Bottom Line: With its extremely wide viewing angles, no speckle, and no glare, the Parallax Thin is well suited for a range of applications in pro AV as well as home theater. The What: Elite Screens’ Manual Grande is a 180-inch, manually retractable projection screen for large-venue presentations. The What Else: The Manual Grande’s MaxWhite 1.1-gain front projection material has a wide viewing angle to accommodate large gatherings. It is also black-backed to eliminate light penetration for enhanced brightness, while the black masking borders on all sides mitigate projector overshoot while enhancing perceived visual contrast. The material is also GREENGUARD and GREENGUARD Gold (UL 2818) certified for safe indoor air quality emissions. The housing is of a durable aluminum construction. It is moisture resistant and available in black or white colors. The Bottom Line: The Manual Grande is specifically crafted for large-room presentations, classrooms, training facilities, lecture halls, and other large-venue applications. It ships fully assembled and is easy to install using the most basic tools. The What: The Model AT from Stewart Filmscreen is an aluminum-tube-frame professional large-venue projection screen available in front-and rear-projection configurations in sizes up to 15 feet high by 32 feet wide. The What Else: The AT frame series are made with seamless aluminum tubing, heliarc welds, shock (stretch) cord, and “S” hooks to secure screen edge through grommets. The screen’s frame assembles in minutes with factory slip-joint corners. Each system is designed and built to a user’s individual specifications and need. Available in either a two-inch or three-inch tube frame for draping or masking on the job site, the AT series comes in a variety of gains, ranging from 0.7 to 3.0, in gray, white, off-white, and 3D finishes. The Bottom Line: Stewart’s Model AT’s custom-engineered design, large sizes, and selection of gain and finish options make it well suited to a variety of applications, including broadcast, postproduction, and commercial AV. The What: The AV Stumpfl Fullwhite is a borderless front projection screen designed to give the appearance of floating in space. It is available in variable dimensions and custom formats. The What Else: Fullwhite screens feature vinyl surfaces—available in a variety of different types, including 3D and high gain—that can be stretched easily and attached to the frame with specially developed hooks on the rear side of the screen’s frame. The frame features a uniquely shaped profile: one side of the profile is skewed to the rear side of the screen by 45 degrees, making the frame invisible when viewed slightly from the side. Fullwhite screens are usually flown on stage or mounted on walls, but AV Stumpfl offers a number of different mounting options to meet the needs of customers. The Bottom Line: The Fullwhite’s borderless design allows for use in variety of applications, and multiple screens can be connected to created projected walls or cubes. The What: The Draper Ultimate Access XL/Series V is a tab-tensioned electric projection screen for ceiling-recessed installation. The all-new Ultimate Access XL, available up to 22 feet, replaces the Signature/Series V.
The What Else: This new series carries over the improvements made to the Access case, including the same re-engineered Access bottom closure panel which is easier to attach, and has an improved overall engagement with the screen housing. An improved “T” bracket engagement allows the panel to hinge downward for service, eliminating the need to make extra trips up and down the ladder carrying the closure. The Ultimate Access XL is available in a variety of materials, including Gray XH600V, Pure White XT1300V and MH1500V, and Matte White XT1000E. The Bottom Line: Ultimate Access XL has an independently motorized ceiling closure. In its closed position, the motorized closure forms a solid bottom panel giving the ceiling a clean appearance. At the touch of a switch or wireless transmitter, the door opens into the case before the viewing surface descends into the room. The What: Pro Display’s Ultra Black diffusion screen is a black-tinted rear-projection screen, providing high contrast and resolution. The What Else: The non-glare matte surface provides sharp, bright images at all angles. Featuring a peak gain of 2.4 and 140-degree viewing angle in sizes ranging from 30 to 138 inches (with custom sizes and shapes available), Ultra Black provides a cost effective alternative to other black screen technologies. The Bottom Line: Pro Display’s Ultra Black screen technology is designed for high-end video and advertising, and is especially suited to control room, home cinema, and multi-screen applications. The What: The dnp LaserPanel is a high-contrast, wall-mounted projection screen designed to be used with an above-mounted ultra short throw projector. The What Else: dnp LaserPanels are based on optical screen technology, and powered by a laser projector mounted over the screen, which shoots down from a steep angle. The display is mounted on the wall like LED flat screens. The compact, 100-inch display can be fitted into any conference and meeting room, and is available as a one-box solution including laser projector, screen, and projector mount (touch version). All elements of the display can be mounted on the wall with the projector above or below the screen. The Bottom Line: The dnp LaserPanel is available in a standard version and a Touch version for interactive presentations. The dnp LaserPanel Touch is equipped with an interactive camera and IR pen. Both versions are designed to offer a cost-effective alternative to a large-screen flat panel display. The What: The Severtson 4K Thin Bezel Series is a collection of premium fixed-frame Severtson projection screens that offer a sturdy extruded aluminum frame with a 3/8-inch visible bezel which can be removed for customers desiring zero-edge border options. The What Else: The 4K Thin Bezel Series’ durable, aluminum frames offer the thinnest visible frame that Severtson Screens can provide for a clean appearance that maximizes the viewable area. Customers can choose from a variety of tensioned screen materials with optional optical coatings or acoustic options. The series includes the SAT-4K, a pro AV screen with virtually no size limitations. Acoustically transparent, the entire sound stage can be placed directly behind the screen at the same horizontal axis. The Bottom Line: Available in Impression, Deluxe, and Deluxe Curved configurations, 4K Thin Bezel Series screens meet or exceed all industry standards for optimum video and acoustic performance, providing reference-quality reproduction of the digital image combined with true fidelity of the original soundtrack. The What: The Nippura Blue Ocean is a line of rear-projection screens designed to maximize the capabilities of any high definition projector, including in ambient light conditions. The What Else: Blue Ocean projection screens are cast into a high-tolerance viewing plane centered between two ultra-clear panels of cell-cast acrylic, the same type of material used in fighter jet canopies and the world’s largest aquariums. The thickness of each screen can be fabricated so that it maintains its form without external frames or tension systems. Its frameless design is engineered for high definition projected images without borders to amplify the depth of the viewing experience. The Bottom Line: Standard sizes are available in 72, 84, and 100 inches in 16:9 aspect ratio. Blue Ocean screens can also be custom fabricated into nearly any geometric shape imaginable: curved walls, hemispheres, teardrops, or tunnels. The What: The True Aspect Masking (TAM) 4-way screen from Seymour-Screen Excellence features motorized masking technology that allows for the same image area for any aspect ratio between 16:9 and 2.40:1. The What Else: The TAM-4 features one of the industry’s thinnest borders and sophisticated frame design, with an added secondary set of masks. With a narrow, 4-inch border and 6-inch depth, the TAM-4 screen maximizes the available image space in the installation, and features high acoustical transparency with its Enlightor 4K screen fabric. The constant-area screen uses four independent acoustically transparent masks. It is therefore well suited for any lens that can zoom from standard 16:9 to “scope” ratio content that varies up to 2.40. The Bottom Line: The TAM-4 combines a reference-quality projection screen with automated masks controlled electronically for complete, versatile masking with any automation system. It can also be simply controlled by IR or RF remotes. The What: The Screen Innovations 5 Series Motorized line of projection screens is engineered for versatility, and is available in a wide variety of sizes, aspect ratios, and surface materials to accommodate nearly any application. The What Else: The 5 Series Motorized screens are precision cut on computer-drive cables, and are built with dependable Somfy motors. The motor limits are designed to be simple to set up and operate with all included controls—wall switch, IR receiving eye, IR remote control, and low-voltage trigger. Surface materials for the 5 Series include the 65-percent ambient light-rejecting Slate, acoustically transparent Maestro, and ultra-fine Pure. The Bottom Line: The 5 Series Motorized is designed to suit the needs of a variety of use cases, including business, houses of worship, hotels, conference rooms, colleges, universities, and more. It is suitable for nearly any commercial environment, regardless of lighting conditions.